Appearing on the Time Magazine’s 100 most influential people, Malcolm Gladwell is a Canadian journalist based in New York. In addition to being a bestselling author of four books, Gladwell is also a speaker and has been on job as a staff writer for The New Yorker since 1996. His books, The Tipping Point: How Little Things Make a Big Difference (2000), Blink: The Power of Thinking Without Thinking (2005), Outliers: The Story of Success (2008), and What the Dog Saw: And Other Adventures (2009) have all appeared on The New York Times bestsellers list. His works deal with research in the areas of psychology, social psychology and sociology. On June 30, 2011, Gladwell was appointed to the Order of Canada. Malcolm Gladwell was born in Fareham, Hampshire, England on September 3, 1963 to Graham Gladwell, a British mathematics professor and Joyce, a Jamaican psychotherapist. When he was six, Malcolm moved to Elmira, Ontario, Canada with his family. In Canada, Malcolm’s father taught mathematics and engineering at the University of Waterloo where Malcolm sometimes went with his father wandering around the offices and exploring libraries which sparked an early interest of reading and literature in him. During his high school years, Malcolm was an exceptional middle-distance runner. He won the 1500 meter title at the 1978 Ontario High School 14 year old championships in Kingston, Ontario. In 1982, Malcolm interned at the National Journalism Center in Washington, D.C. Two years later in 1984, Malcolm graduated from the University of Toronto’s Trinity College with a degree in history. 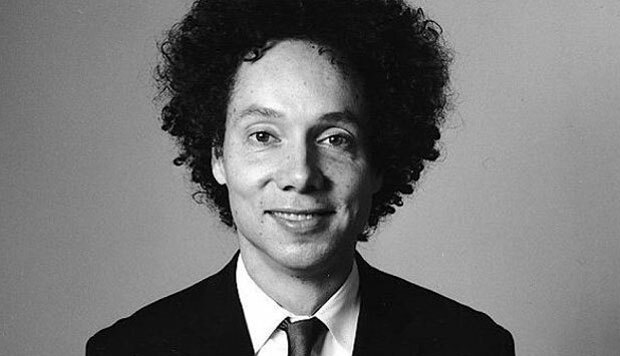 Since his grades were not acceptable to enter a graduate school, Gladwell decided to pursue a career in advertising. However, here too he faced rejection and was not accepted in any advertising agency. He moved to Indiana where he was offered a position at The American Spectator. During this time, Gladwell also began writing for Insight on the News. By 1987, Gladwell’s name was appearing on The Washington Post where he was covering business and science. He worked at The Washington Post till 1996 when he shifted to The New Yorker. Gladwell’s first assignment at The New Yorker was to write a piece on fashion. Gladwell chose to write about a man who manufactured low price t-shirts instead of writing a piece on high fashion. His work in The New Yorker was appreciated by the readers and he gained recognition with two articles in particular, The Tipping Point and The Coolhunt, both written and published in 1996. The articles later became the basis for his first book, The Tipping Point. Gladwell received an amount of $1 million for this book. In addition to being recognized and appreciated for his works, Gladwell has also been acknowledged with prestigious honors such as the American Sociological Association’s first Award for Excellence in the Reporting of Social Issues in 2007, an honorary degree from University of Waterloo in 2007 and another honorary degree from the University of Toronto in 2011. Currently, Malcolm Gladwell continues to write for The New Yorker. He also serves as a contributing editor for sports journalism website, Grantland.